We offer certified translations of personal, financial, academic and legal documents. Professional translation of your degree to apply for employment, higher education institutions such as colleges, universities and more. We specialize in Hebrew, Spanish, English translation. BBT Translation Services is an American translation agency located in Florida, USA. We provide translation for education of documents in over 30 languages such as Hebrew, Spanish, English and more. We can translate your degree professionally. When you order a translation from us you will get a mirror image of your document. We translate the logos, stamps, titles and any text in your document. Our translators are native speakers fluent in the language who provide professional translation of your documents such as translation of your diploma, transcript, degree, certification, certificate of completion, and our translations are accepted by colleges, universities, schools and any employment or government entity that requires a translation of your proof of education. We are members of the ATA - American Translators Association and our translations bear the logo and the membership number of our registration with the ATA. Our translations of certificates are done word for word and abide by the standards of the USCIS and other governmental institutions. We guarantee that when your order from us - your translations will be accepted! If you are looking for a professional translation service that can translate your certificates and remove the headache from searching and guaranteeing that the translations are good - don't think twice - we are professionals in the translation business and we know exactly what is required for your translation to be accepted by universities, colleges, employment and anywhere where a certified translation of your academic record is required. Yes. All the translations are certified. Our final product consist of the translated document with a certificate of accuracy which states the completeness of the translation and the ability and knowledge of the translator. This declaration is printed on our letterhead and is signed by the translator and notarized by a Public Notary . The translation is inserted in our letterhead and it bears the stamp and signature of the agency. Notary signatures are available upon request. How Much will the Translation of your Degree Cost? 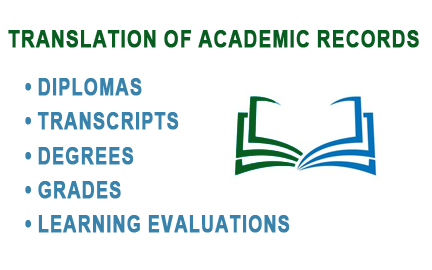 What type of academic records do you translate? We translate any type of certificate that you can imagine. For example we translate: diplomas, matriculation certificates (Bagrut), completion certificates, degrees, licenses, transcripts, grade sheets, certification of studies, basically - any certificate that you may have. All the translations are certified. A certification - or "Affidavit of Accuracy" is a statement attached to the translation signed and stamped. This certification is required when ordering a certified translation. This is a statment that sometimes may be signed by a notary. Not all translations must be notarized. If I am interested, how do I order? To order you can scan, fax or take a nice picture with your smartphone of the document that you want to translate. E-mail it to us. Once we get it you will receive a quote. If you are happy with our quote, you will be requested to process payment. Once the translation is paid we will translate and send it to you via e-mail for review and confirmation. 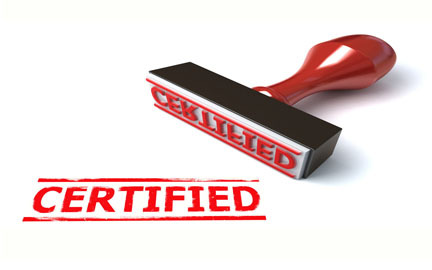 If there are corrections to be made we will correct and certify the translation of your certificate. The translations are paid in advance through the PayPal payment system. You can pay with any credit or debit card or even use PayPal. How do I get my translation? All the orders include a digital PDF file of your certified translation. If you need the hard copy we can mail it out to you. Please visit the rates page to see the mailing choices. To get a free quote e-mail us your documents. We provide professional and accurate translation service of any document from over 77 languages such as Hebrew, Spanish and more. 100% Guarantee to be accepted. We follow the translation standard required by the immigration offices (UCIS).